is about the ways I and my friends and my patients have learned to cope with our ADD. I am not quite perfect yet, so I will happy to hear from others about their coping strategies, or their comments about mine. Hoping for lots of comments! 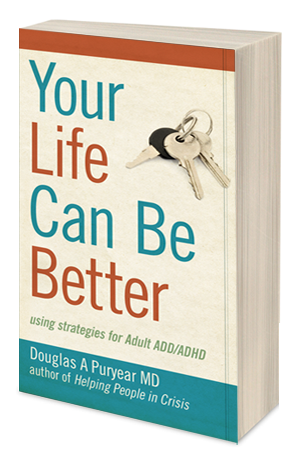 The book focuses on strategies for coping with the problems that ADD or ADHD causes. The Principle is to identify a specific problem, create a strategy, make a rule, stick with it until it becomes a habit. It is important to only try to change one or two things at a time. An e book, for Kindle or other platforms. It is not a book to sit down and read. It’s like a daily devotional or a theme calendar, with one tip a page, to be read one a day, at your own pace. The purpose is to inform you, encourage you, and help you to stay on track. Currently reading Your Life Can Be Better and really enjoying it. All of the first had advice really makes it easier to apply and helps me not feel like I’m the only one struggling with some of these things. Thank you so much!! How can I sign up to get notifications of new blog posts here? janal – oh, no, you are not the only one at all! our tribe is 4% of the population. glad you are enjoying the book and its helping. sign up – i think you will find a little “follow” message to clik up the upper right under the big picture. Thank YOU for blogging and for writing Your Life Can Get Better. I’m 11 chapters into your book, for the first time in ages I can see a light at the end of the tunnel. All my life I have struggled with a lack in discipline, will power and motivation. I always thought there was something wrong with me, how can everyone else around me remain so organised so easily and achieve their goals? I’m still struggling to accept the very recent diagnosis that I have ADD because I am conditioned to thinking that I am just lazy. Your book is incredibly helpful, so thank you! I will be recommending this book to my therapist so that he can share it with his patients. Do you, by any chance, know something about ADHD and pregnancy, or where to find good info on that? busy- boy, what a great question. i know nothing and my pregnancy expert daughter doesn’t either. i guess just look up the relevant meds and pg, but otherwise, it’ just getting enough sleep, continuing exercise, and whatever tools you use for stress? easy for me to say. if you do find more info, please put it here. I will. Essentially we don’t know much about med safety and my doc advised me to quit during pregnancy. Apart from that…. See above. Thanks. did you research to see if you need to stop? theres a risk/benefit equation. certainly the mother being depressed is not good for a fetus but i don’t know about the ADD ADHD part. busy – sounds right. you have to decide how bad the ADD SYMPTOMS ARE. being stressed out is not good for you or baby. ok i’m start to read your book , and it’s a little hard like if you need to read it in Italian do you understand? But i’m understand lot thing when i’m start to don’t use my mind to traslate everything. Gabroele – What a great comment! you are right. 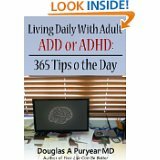 now that you know you have ADD ADHD you can do a lot about it. I am glad you got the book and that it is helping. it must be very difficult in Italian – maybe someone will translate it? i like your strategy of using the colored paper and the today/ tomorrow lists. gabriele – i apologize for misspelling your name. I’m learning Italian, so I’m happy to translate anything you don’t understand, maybe we can work on it together? I love your book, your humor, and the many short stories you included in the book. I’m not done with it yet (of course not, since I’m reading 10 books at once) but I wanted to express gratitude before I forget (do it now, do it right … ) Thank you so much!! anon- glad you like it. And sounds like you are putting it to use. And that you have the concept of taking it slowly, small steps, and not trying to read it through all at once. I think that’s the best strategy. I never read 10 books at once, only four. thank you so much for commenting and please come back. Maybe if you can keep it to 10 you are doing well? My stack is about 10 but I’m actually reading only about 4 at a time. I discovered your book yesterday and read it mostly in one sitting. I am also a medical professional with my own practice and constantly am looking for and developing “strategies.” Your tips for sticking with them, developing “rules” etc. are just what I need. It is indeed thorough and extensive, but broken down enough to prevent overwhelm. I am just of course impatient and wanting to implement it all right away. Unfortunately, my spouse likely has ADD as well, and so disorganization and forgetfulness tend to be the rule rather than the exception in my household. I will try to get him to read it as well, but he doesn’t usually finish books… 😉 Thanks so much, your book is worth more to me all the rest of them put together! sierra- thank you for the heartwarming comment, made my day. you remember about the concept of not trying to change too much at once, pick maybe the most important one or two. and would your spouse maybe read it at a chapter at at time? it would be lovely if you wanted to copy your wonderful comment and post it as a review on amazon or where ever you got the book. yes, i use ADD mostly, because thats what i mostly have. for most men the H mostly wears out at adolescence. and for most women, its just ADD and not ADHD. thanks for the ping (tho i’m not sure what a ping is. is this a comment? I loved your book. I read it on my Kindle. I finished it in 24 hours, I usually do not finish books. I love workbook for they are easy for me to read. I have LD pretty bad and OCD. Not sure if I have ADD or not. Some DR say I do others says I don’t. My mom said that I had attention problems as a child. Well your book helped me. i am really glad that the book helped. i think it could be helpful to many people even with out add. thank you so much for commenting. Thanks, Doug. As a matter of fact, the book you referenced was the first book that I read that gave me a clue that I was seeing the effects of adult ADD in myself and in my relationships with my wife. Found yours when I was focused on downloading everything I could find on Amazon for download to my kindle. Discovered for me, that downloading free samples is the best way for me to go. Used to buy all the books that interested me, but you can imagine what that ended up being like. As soon as I read the sample of your book, I bought the book on my kindle DX and read a chapter at a time. So far I’m only up to chapter 16, so I’ve got a long way to go, but your book is my “go to book” now. I’ve deleted most of the other samples, so I’m not so scattered. When you put that little drawing of your computer desk and computer in there, that really made an impact on me. That could have been mine! Almost exactly as to what you have and where you have it. You are now the ADD guy I refer to more than any. I refer to you as “The Doc” when I’m talking about your book with my wife. You have helped me more to understand myself and that has helped me to be able to talk about lots of things that I never really understood very well, and never could talk about because I had no “vocabulary” to refer to. You have given me a wonderful gift, and I can’t thank you enough for taking the time to write that book! Oh, HSP is another thing that I have recently come to realize has an effect on my life as well as my wife. It stands for Highly Sensitive Person. The book I’m reading right now, along with yours, is “The Highly Sensitive Person in Love: Understanding and Managing Relationships When the World Overwhelms You” by Elaine Aron. “The ADHD Effect on Marriage” by Melissa C. Orlov was very much an eye opener for me. As an Aspie, I also get a lot from “Connecting With Your Asperger Partner: Negotiating the Maze of Intimacy”. When I discovered that Aspergers and ADD can both be present, that was very much an “aha” moment for me. Also reading “Is It You, Me, or Adult ADD? Stopping the Roller Coaster When Someone You Love Has Attention Deficit Disorder” by Gina Pera. I don’t know how I could be 66 years old and never have realized some of these things about myself. Thanks again for helping me to understand myself better. you are most welcome, your note is most gratifying to me. sounds like you are reading at least 3 books at the same time – another thing we have in common. I have just discovered your book recently and downloaded it to my Kindle DX. It is the best thing I have ever read that describes me in so many ways. I’m 66 years old, and just coming to the realization that my life has always been difficult for me because of undiagnosed ADDHD, coupled with some Aspie characteristics inherited also, influenced by being HSP and also being influenced by a high sensitivity to sugar. And those are just the things I’ve discovered about myself recently. You have given me the best insight into myself that I’ve ever had. Thank you so much for writing this book and also for putting up this blog. I have a grandson named Michael, too. My wife and I have been married for almost 40 years, and have never understood many of the difficulties we had encountered in our relationship. We’re coming to some better understanding of me and why I do the things I do, and that has helped me more than anything. Thank you so much for showing the way to others. i am so glad that the book is helpful to you, and to your wife too then. not sure what hsp is – hispanic?? well thank you so much, that is very kind. i will check it out. first of all I would like to thank you for your book. The “close your eyes and summarize, while reading” strategy alone was worth it. How did you write your book? Did you find any additional special strategies (besides those generals ones you described in your book) for collecting material, evaluating, summarizing, making a script etc.? How to cope with a blank page? Writing some crap just to get started, does not really work for me. I get lost very fast and write something crazy. For example: I sat down and wrote a introduction for my thesis. I began with the reception of computer games in the media, introduced Max Webers “Die protestantische Ethik und der Geist des Kapitalismus”, I cited Nietzsche to show whats wrong with our work ethics and mused how this will change in a “post-scarcity-economy”. Then I remembered that my thesis is about the application of machine learning in computer games. Why is machine learning relevant for games? How do I measure relevancy? Why did I choose this game? This enables me to structure my writings, without knowing specifically what to write. Then I answer the questions and delete them. The answers alone are now a pretty good manuscript, its like magic. this is a great strategy! good question, hard to answer. i often had an inspiration, something i wanted to write, and then the problem was where to put it. did a fair amount of writing first, then could make a very rough tentative outline of what the major sections would be, then fit the pieces in where they fit. always a card in my pocket to jot down ideas as they occurred (now could use the memo app of my i phone). tried to make sure i wrote something every day, noted “B” on my bedside notebook as a reward when i did. after i got the first draft done i had a lot of people reading the various drafts. the final draft was # 29, lots of revisions and lots of reorganizing, and lots of taking stuff out of it. HI! I loved your book (purchased on Amazon, still reading on my smartphone), and now I found your blog. That’s great! I just started your book today and have read several chapters. I think it may be the most helpful of any of the ADD books I’ve read to date. I am enjoying the specific, down-to-earth tips and advice as opposed to the more nebulous theory in other books. I bought the book as an ebook but like it so much that I may order the hard copy. Which brings me to something I’m curious about. Do others with ADD have any trouble with ebooks? Particularly with reference-type books, I like to flip back and forth, read certain passages again, flip to the Table of Contents, double-check the Index, etc. I like to be able to see, “Ah, I’m halfway through this book.” Perhaps for the same reason, I always hated using spreadsheets at work. I want to be able to see “everything” at once. My tablet works fine for lightweight fiction, but otherwise I prefer a hardcopy. Does this have to do with ADD or is it just a personal quirk of mine? I am also thrilled to have found your blog! Thanks! Im thrilled you found it too. i dont know the answer to your question. i have only read one e book and it was ok but i really like books and like you prefer the real thing. however, the book has sold a lot more e books than paper. i will ask the question on the blog. thought some more about your interesting question. will still blog about it, but i think the main thing is you seem to know what works for you -lightweight fiction on e books, others in paper. so thats good, not a problem. we are each different, and each needs to find what works for us. It isn’t so much a problem as just a curiosity about how our minds work. I’m trying to embrace new technology – when I am able. At least with the tablet, you always know where your books are! Now where did I leave that tablet . 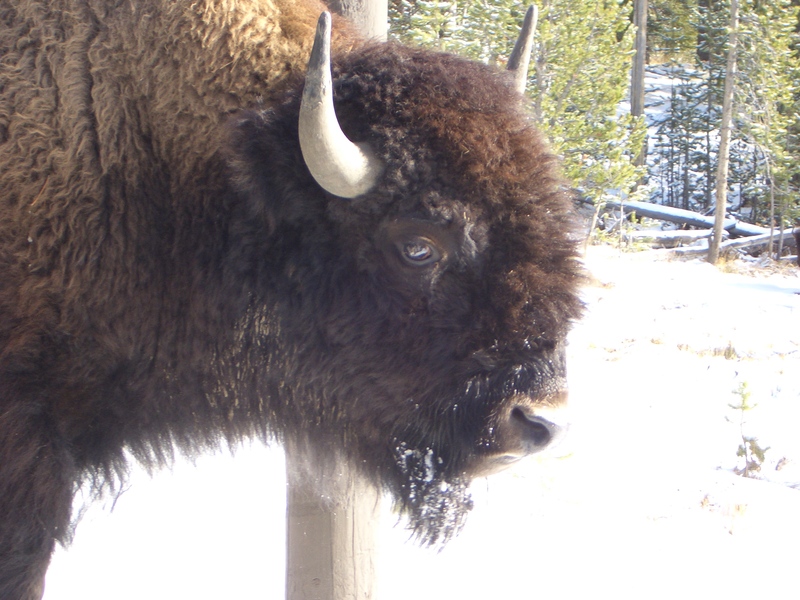 . .
Hi Dr. Puryear and Pam – I feel the same way about ebooks, Pam, and share your curiosity about how our minds work!!! I study cognitive psychology and think this would be a great research topic! Dr. Puryear, I also wanted to say thanks for the book. I’m a mid-life adult who only realized a couple of months ago that my decades long struggle with anxiety and depression has very likely obscured a missed ADHD diagnosis. When my mother, a psychologist, suggested she thought this might be the case I scoffed at the idea; how could I be ADHD and not know it already?! I’ve had over twelve years of weekly therapy, and after three undergraduate degrees have finally found my niche in cognitive neuroscience…STUDYING ATTENTION!!!! When I decided to take her seriously and look into it more closely (I study “normal” attention and don’t know much about clinical stuff beyond my own experience), I bought your book (and a few others, of course, I can never buy only one book!). It was reading your book that made me realize my mother is correct. Reading the descriptions of your thinking patterns, experiences, problems and strategies have resulted in the largest mental “clicks” of an already extremely self-examined life. As well as a lot of crying – from the relief of finding where i “fit”, and that there is hope my life might not have to be so hard anymore. I’ve still got three weeks to wait for my appointment with a new psychiatrist to revisit my diagnoses, and am using your book to help myself in several ways in the meantime. First, I’m trying some new strategies in addition to the ones I’ve come up with on my own – and trying very hard to focus on only a couple at a time!!! Second, and most importantly, I’m using your book as a blueprint to construct my medical case, as it were. I have a hard time organizing my thoughts in-the-moment to explain something I’m emotional about (overwhelm!!!). So to help me explain why I think I have a missed diagnosis, I’m trying to write down all the AHA moments I’ve had since I started looking into this. Your descriptions are an invaluable aid – they’re helping me to explain things I’ve never had the right words for before. And the structure you worked so hard to produce is equally invaluable as an organizational aid; it’s helping me to organize my own thoughts. I don’t need to tell you how much more likely it is that I’ll go into that appointment with a somewhat complete description now that your book has made it easier for me to accomplish it. And now I’d better get back to it ;). Shannon- thank you, you’re very welcome. great idea to write things down before you go in. Fascinating that you are studying neuroscience and attention. I hope you will a lot of comments, particularly from your insights and knowledge. Good luck on your evaluation. I hope your psychiatrist is one who knows about ADD ADHD – a lot of us do not. favorite had a fleet of ships trying to blockade the russians coming out of a strait- Strike Fleet. spend many hours with that. My Priest just suggested I look into ADD strategies and I found your book. It is very helpful! Thank you! I think it is my favorite of the 5 or 6 books I have looked at so far. I keep thinking of something that a friend of mine told me she does (and that helped her build her own house!) She keeps a progress notebook where she writes down everything she gets done. Lists that get crossed off and thrown away are good, but nothing helps that sense of accomplishment quite as much as being able to look at the long list of things completed. Thank you for the work of completing your book so all of us can benefit from it! Great! you must have a pretty sharp priest. I hope the blog will be helpful to you too. Doug, I just found this blog from your book. I haven’t finished the book yet, but so far it speaks to me. I recently started realizing/understanding my ADD because of my son’s diagnosis and his struggles. Thank you for sharing your experiences – they are helpful for me to try and understand myself. i am really glad to hear that. hopefully this understanding can help you and your son both. thanks for commenting. I’am reading your book, I had from Ipad Store 😉 I like very very much, it is not like others, I will tell you what I think when I finish. At the moment I agree with list but… I don’t have papers or cards, I write everything in my PDA… Congratulations!!! you use the pda – that just tells me that you are younger and smarter than me, i’m tech challenged. sounds great! but i am very tech challenged (dystechnologica) and havent gotten to the cloud yet, still trying to master the i phone my kids gave me and struggling with facebook. I especially hate all those “intuitive” comments. Learning tech is like learning a language. NOTHING is “intuitive” until you’ve built a foundation (including Apple). Madelyn-oh my. Do I know what you’re talking about! Not everyone with ADD is tech challenged, but I think more of us than the vanilla’s. Ctrl-Z brings back whatever you just deleted, usually. Cursing at the computer doesn’t work, always. thank you! but i didnt delete anything, i just cant get the comments to show up on the blog. this is all new to me trying tot learn how to make it work. for ex, sometimes comments show up and sometimes not.- whats that about?? ?